What are the advantages / disadvantages of the different zip positions ? I've seen shoulder, diagonal across the front and hinge. To an extent, it depends on how many mates you have. A rear across the shoulder zip for self fastening is a real struggle, although the end of a roof rack, or a peg in changing room may just get you out or in on your own. A comfort zip would be an essential addition to an across the back set up. I can get in and out of my diagonal suits on my own, and just about manage to pee. I have occasionally had to use the roof rack to start getting out of the sand yachting kit "'cos it was covered with fine sand. Not sure what a "hinge" is. Many years ago had two piece suit, pants and jacket had soft rubber at the join and one used to roll them together. I was a sailor rather than a paddler then, and was immersed quite frequently. Worked fine, just eventually wore out elsewhere. 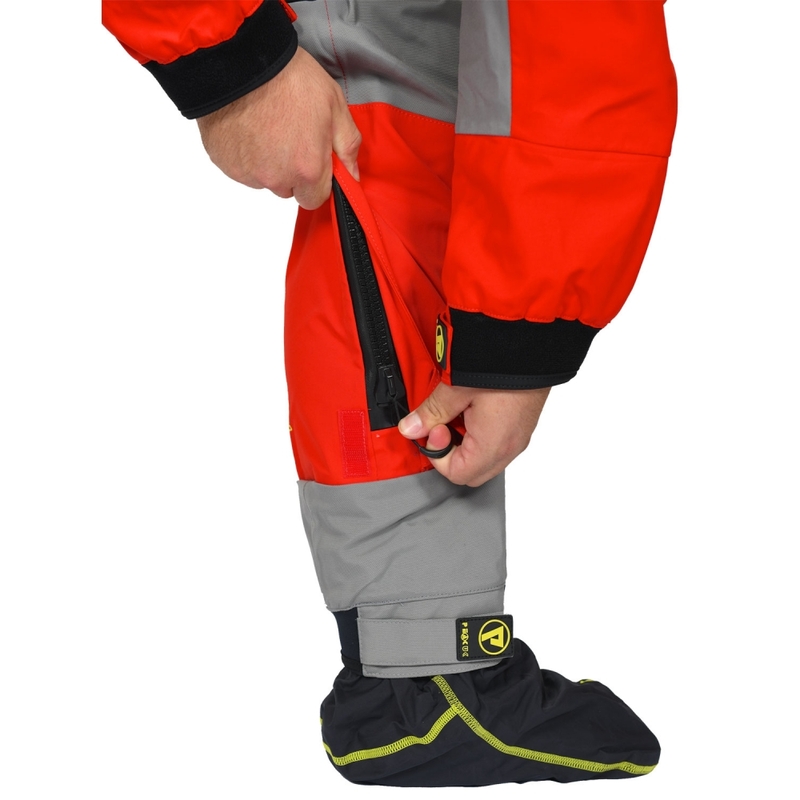 I never seem to have to buy a dry suit when flush with money, so tight fisted, have not gone for extras other than ensuring the suit has braces, but I really, really think a comfort zip should have been essential. Finally, remember that you might want quite a bit of kit on underneath. The "venting when crunched up" to get rid of excess air from the suit also tightens in a generous cut. Mine has a rear zip but, importantly, it comes round towards the front of the shoulders a bit. Though it's easiest to use with a mate to help, I can close it on my own and, thankfully, open it! This does involve a sling and carabiner attached to a handy point, often my roof rack! The advantage of rear entry seems to be that they're less obstructive when paddling. The various long curved front entry options seem much easier to get in and out of, but there's more stiff fabric that may hinder paddling, though I've never heard of any user really moan about it. There are some where the legs have the zip, but never seen those in use. Possibly the ultimate are the ones that are basically top and bottom which zip together in the middle, but they cost a fortune. Any minute now, somebody will recommend Dam X and the Typhoon Multisport as great value drysuits, and they won't be wrong. Oh yes, get a comfort zip whatever else you decide! I have a Dam-X with a plastic (Ti-zip) shoulder zip and a Typhoon PS220 with a metal shoulder zip. The plastic zip slides more easily and I can do it up myself without too much problem, the metal zip has to be re-lubricated with beeswax to do it myself. Although, having done it up, I've had to ask for help pulling the back of my BA over the ends of the zip where they extend across the shoulder. I haven't worn a hinge suit but they look good - the zip is round the back 3/4 of the waist, which has toilet advantages as well as getting in and out. It might be a problem in a kayak, with a spraydeck, but should be fine in a canoe. A friend has one of the Peak suits with the zip up the inside legs. The issue he's found is that if the zip leaks anywhere, it's at each end, and having the ends at your ankles means they are the most frequently and deeply submerged parts. I use the DamX with a comfort zip. It must be almost twenty years old. I've had new feet, cuffs and neck seals in that time but it's still in good shape. My son got one a few years back with the new plastic rear entry zip and it's much easier to open and close. So I'd happily recommend the back entry zips. I've a Typhoon multisport max-B I think the model is. Zip is on the front from left hip to right shoulder, never found it to get in the way and it's a skoosh to use. Colin, you're welcome to pop round and try my Multisport 4 on for size and fit and have a go in the Pal with a kneeling thwart fitted too. For most open canoeing you want a sea kayaker's drysuit rather than a white water kayaker's drysuit: something with an open neck or neoprene neck seal that can be opened up - as you ain't going to be getting dragged along upside down! That's a suit that you put on like a cag (over the head) but with sewn in legs: awesome! 1. If your zip does start leaking... it's in the bit that gets submerged a lot. In that scenario, you might wish your leaky zip was across your back. 2. You lose the option of pulling the suit down to your waist, held up by braces: convenient on really hot days. I run pretty hot so I do this almost all the time when off the water. Yeah, my Palm has a neoprene elasticated internal waist thing to hold it up when the top is off, and this isn't nearly as effective as braces! I bought my second dry suit on ebay, used, to protect me from flying wet sand when mini land yacht sailing at up to 40 mph. It was fine, but a nuisance in the warm before and after as without the top properly on it slipped downj. For a miserly sum and a very rapid turn round Rubberman put in a posh set of braces. Problem solved. Pete, as I'm within spitting distance of you, it would make a lot of sense. I'll pm / text / phone you. Only 40 Peter? I've broken 50 in my kite buggy, I thought fixed mast yachts were meant to be faster? I use cheapest drysuit (lomo) for landsailing, the sand and mud is really pretty hard on them. Zip position is a personal preference. I still have pretty good range of movement and can zip and unzip a back zip on my own no trouble (you need to pull it taught along the sleeve opposite the diretion you want to pull the zipper), so for me back zip is best. I actually find a diagonal front zip harder to get in and out of although accessing the zip yourself is easier. When it comes to zips, Tizip Masterseal are the way forward for a back zip, much easier to zip and unzip than metal zips and more reliable than the basic tizips, it doesn't matter as much with front zips, although I have seen metal zips jam/jump/or damage teeth trapping the occupant until a friend with a pair of mole grips can force the zip - I should of course mention that this is only in the context of hooning around on beaches at 30-50mph with wet sand flying everywhere, and never in a paddling context! hi Jim. Just watched Portillo in Glasgow. Really must visit sometime. Between 40 and 50 my vehicle is prone top twichyness, which I find very scary. Mine is also under rigged, and so we are into "whole trees in motion" and big gusts which can also be a bit scary. I've come to terms with "flying a hull", and the concept of "sailing back to the moorings" also translates. Apparent wind and velocity headers are rather more interesting at speed, not just the spinnaker collapsing. !!! Not to worry, I was joking, I don't think mini-yachts are especially fast being roughly the same sort of size as a kite buggy so limited in sail area and directional stability. We have the advantage of keeping the CE low so overturning is less problematic (if you fly the kite in the right place). Unofficial (GPS log) buggy record is 86mph using a specially built buggy that's longer than normal, and essentially launching the kite into a dust devil on a dry lake bed and hanging on! I know the land yacht record is over 150kph and is properly recorded by light beams, presumably there and back as required for official records - but not by a mini yacht, and not by a yacht conforming to any of the racing classes but again a custom built speed record machine. There is no doubt though that the class 3s are much faster than us, probably the 5's too. I think wind and velocity vectors will prove the limit of kite based speed, the faster you go the more the apparent moves to the head, but because the kite is flying an arc on tight lines it will tend to move back to achive optimum angle of attack without collapsing, which means the pull is more sideways and less forwards the faster you go. A spinnaker collapse is scary, but you should also try having a race kite collapse at speed and then re-inflate pointing in a random direction! We may have digressed from drysuit entry? I have a hinge zip (typhoon?) Its an entry level model (no pun intended) The zip runs round the back and it presses slightly when wearing a BA and particularly with kayak a spraydeck on but not uncomfortably so. Next time round I'll go for a different zip configurations ohh yes and a comfort zip (much more important). Anyway, must dash I've got the afternoon off and there's a big yellow canoe strapped to the roof of one of the cars in the car park. I manage to find one that has various entry positions.